Pumpkin spice, blackberry cobbler, creme brulee and apple cider candy corn. That's just wrong. Candy corn is pure sugar, does it really need flavor? However, pumkin spice Hershey's Kisses are awesome. 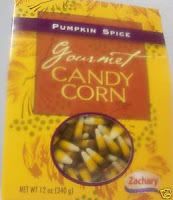 I've had the creme brulee candy corn and it is AWESOME. And I don't even LIKE regular candy corn!